Thanks for this great overview of the pros and cons. I have just discovered that our institution has switched to EBSCO access and your description will help me immensely in pointing out the potential pitfalls to students. 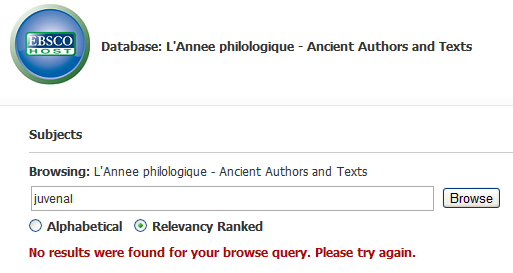 Just been given a trial of Ebsco at Cambridge Uni (UK) but not impressed with first search. We do not default to advanced search just a box and entered keyword Cartledge Sparta. I was told no hits but smartsearch had found me 13 items which were right. But put same search in default box on native ApH interface and got 21 hits. Some of these not on Ebsco. So not impressed in first few minutes. Then had a look around for reviews and found your helpful blog post. I will give it more time when term ends. I want to stress that as an Exlibris library, Ebsco prevents linkage to articles full text. This was supposed to be the big draw. I actually brought together several faculty members with Ebsco reps as they were constructing the db. I asked directly if there would be links to articles and they re-assured me. But it never happened and now Exlibris and Ebsco are in a tug of war leaving subscribers the losers. I also am not impressed with the search capability or the results display — probably because I cut my teeth on the print!! and the native db replicates it pretty much.. If you are an Exlibris library, stick with the native. Thanks for the update Ruth. We are an Exlibris library so that is good to know. I will report back.